Mr. Jerry Davis is a native of Sumter, SC. He completed his Bachelors of Music degree from the University of South Carolina with an emphasis in Music Education. Mr. Davis taught in the public school systems for five years, teaching music to hundreds of students of all levels, elementary to high school. During those years, he was the band director of the Palmetto Center for the Arts, and had the pleasure of conducting the Richland County Honor Band at the USS Missouri Battle Ship in Pearl Harbor. After his service in the public school system, Mr. Davis returned to school to receive his Masters of Music degree in Performance at the University of North Carolina – Greensboro. 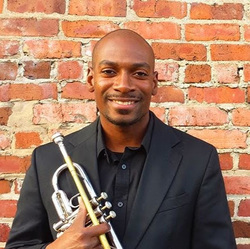 He currently resides in Greensboro, NC with his wife, and performs as a freelance musician and trumpet teacher. He is the founder of the Horns of Zion gospel horn-line, and performs with the North Carolina Brass Band. Mr. Davis is passionate about helping educate today’s youths and training up talented musicians.